The Conan O’Brien show is filming in Chicago this week and Chicago’s own Trinity Irish Dancers, the 13-time World Champion Irish dance school, will be dancing LIVE on the show tonight! Dancers include kids aged 10-19. The show airs tonight at 10:00 p.m. CST on TBS. We have a number of young friends among these dancers and know what long hours they practice and how much time goes into learning the dances and performing out all over town! Check out all the energy, passion, stamina, and athleticism under those bouncing curly wigs! 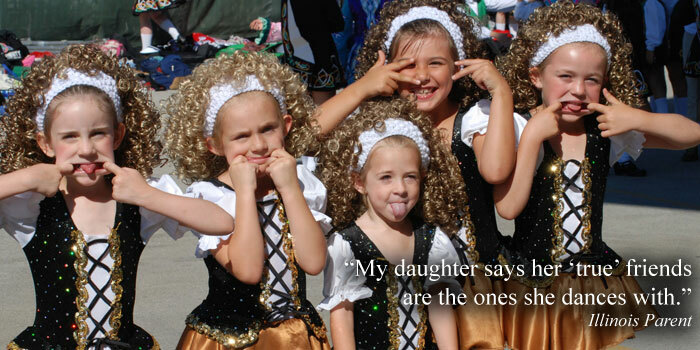 For nearly 30 years, Trinity Irish Dancers has thrilled audiences with inspiring showmanship. From humble beginnings in church basements to recent engagements as U.S. ambassadors on international stages, Trinity dancers consistently possess a unique energy and passion for Irish dance and culture. Trinity’s unique program gives dancers the power of choice in their journey with lessons of commitment, hard work and team building. Trinity teachers shape the lives of their students by passing down not only impeccable dance technique, but also lessons in gracious sportsmanship and how to act with dignity and integrity. Trinity was founded on these principles and is unwavering in its dedication to the next generation of Irish dancers and their communities. Trinity Irish Dancers has locations throughout Illinois and Wisconsin. For more information, call 773-529-4822 or visit their main site here.